Disclaimer: This post does contain affiliate links which will earn us a commission if any purchases are made. One point of interest though, that you would want to explore immediately you leave the pier is Fort Frederiksted located just a short distance to the left of the cruise ship dock. This fort was built in 1760 and bears a rather interesting history of the island which has flown seven flags from its inception. Another point of interest is the Frederiksted Pier, whose underwater inhabitants have become popular draws to the town. The pier is the scene of romantic sunset walks, dives and pier jumping. It hosts a vibrant habitat of sea horses and night critters which emerge in the evening and makes for a special diving spot in the evening. Too bad jumping off the pier is restricted when there are ships in port. While the name is a mouthful, it really does represent one of St. Croix most diverse attraction. The combination of important archaeological sites, land formations and the sea in Salt River Bay Park creates a diverse ecosystem that is fun to explore. This park boasts of the largest mangrove system in the USVI’s. A popular thing to do here is taking a kayak tour of the mangrove by the day and seeing the bioluminescent bay by night. The 1015acre park protects the islands flora and fauna in the estuary, wetlands and submarine canyon. Salt River Bay is located about 5miles from Christiansted on the northern side of the island. It’s the only place in the US territory where Columbus actually set foot on. You can get to the park by taking route 75 and 80. Damage from the 2017 hurricanes has seen the park’s visitor center remain closed. So, it’s best to visit the park in an excursion or as a guided tour in order to appreciate all it has to offer. Salt River Bay Park has the only remaining prehistoric ball court in the USVI and an important archaeological site. This bay is great for scuba diving. There is plenty to see in the fertile waters teeming with marine life. Point Udall is probably the most unique and popular attraction in St. Croix. It is located on the easternmost point of the island. St. Croix eastern coast is a rugged landscaped of rocky coast and semi-arid vegetation like cactuses. The drive to Point Udall is very scenic. Be the first American to experience the sunrise at the easternmost point of the territorial United States at Point Udall. There is a sundial known as the Millennium Monument on top of the point which was erected to celebrate the azimuth of the first sunshine for the US in the year 2000. If you want to experience some of the best snorkeling in St. Croix then head over to Buck Island. This 176-acre uninhabited island north of the north-eastern coast of St. Croix has one of the largest and most attractive barrier reefs. Buck Island recognized as a national monument consists of 880 acres of protected land and water area. Get a full face snorkel mask from Amazon by clicking here. Buck Island is popular for its underwater snorkeling trail that features plaques that describe the sea life found in the area. The reef is made up of giant Elkhorn coral that forms a fortress-like reef wall. This reef is home to colorful fishes and sea critters. Snorkeling here is bound to leave you with long lasting memories. An additional charm to Buck Island is Turtle Beach at its western point. It features the softest white sands and clearest turquoise blue waters perfect for swimming, floating and playing in. On the northwestern side of St. Croix is Cane Bay Beach. A nice small stretch of sand. A perfect beach getaway. It has great snorkeling and diving off the cane bay wall found only 200 yards offshore. The wall and the reef in the place make for one of the best diving sites in St. Croix. The beach has plenty of amenities and a dive shop, where you can get outfitted for your dive session. Cane Bay Beach is worth the long but very scenic ride there. One of the most amazing experiences in St. Croix is swimming in its tide pools. The north shore of the island is a rugged rocky coast which features naturally occurring pools. These pools are fed by tide waves breaking against the rocky walls of the pool’s basins. A waterproof pouch can be essential just in case you want a swim! Swimming in the 4-5 feet deep pools is an amazing experience especially under the waterfalls created by the cascading waters of the tide breaking over the rocks. But what makes this activity even more interesting is getting there. In order to get there, you need to hike 2 miles from where you park your car to the pools. The hike is challenging and requires you be in fit condition. The hike is, however, more than worth it, rewarding its hikers with scenic landscape. The hiking trail starts at the Carambola, renaissance resort area. It takes a 30-minute cab ride from Frederiksted to get there. Go early in the morning, wear sturdy shoes, carry water, wear sunscreen and go cool off in the pools. 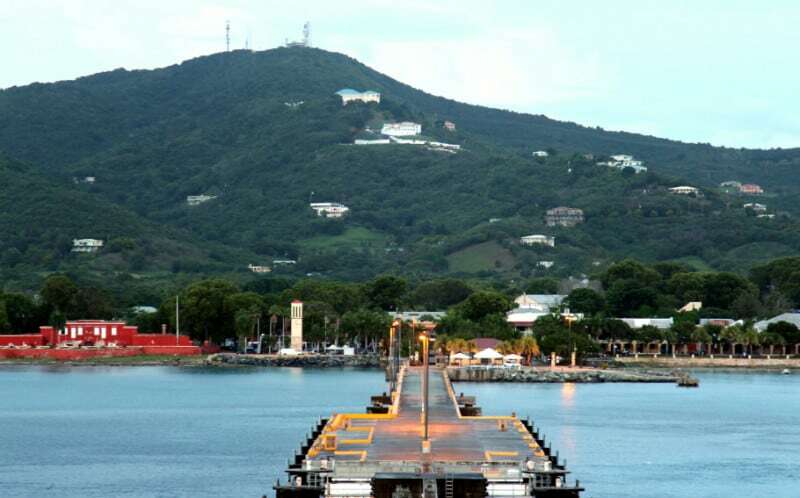 Christiansted is the capital city of St. Croix. It’s located on the eastern coast of St. Croix. This quaint town features vibrant shopping outlets, art studios, and restaurants. It’s a great place to experience the rich history and culture of Crucians. Wander around the boardwalk. Sample the island’s cuisine. Take a break and cool off with a refreshing cocktail. Or learn the island’s history over at the historic district. Here you can visit Fort Christianvaern and enjoy the rich Danish history of the island. Exploring its architectural influence over the island. Other architecturally and historically important buildings include Scale House, Danish Custom House, The Danish West Indies Company Warehouse and the Steeple Building. The fort and park area charges $7 per person. It’s a nice place to visit and learn about the intriguing history behind the island that has seen 7 different foreign regimes rule. St. Croix is a premier dining destination in the Caribbean. Expect a variety of bud tingling delicacies influenced by the multicultural community on the island. What’s great about St. Croix dining scene is the use of fresh ingredients in a farm to table dining experience. Some of the island’s delicacies include pates, Johnny cakes, Kallaloo, grilled lobster, fungi and fish. There are plenty of places you can grab a bite at starting with Polly’s and Turtle Deli in Frederiksted. While in Christiansted you can eat at places such as the La reign chicken shack and Balter. Or you can take an interesting 3 hours food tour where you will sample it all on a fun and educational historical tour around Christiansted. Enjoy duty-free shopping in St. Croix for up to $1600 for US residents. The island has plenty to offer in Jewellery both high end and locally made pieces such as the hook bracelet. Find all the St. Croix souvenirs from Amazon right here. It also offers a variety of paintings and hand-carved mahogany sculptures. Not forgetting unique island spices, clothes, and quirky island souvenir. The best shopping is found in Christiansted. Once known as the garden of the West Indies, St. Croix is dotted with sugar plantation ruins. In its heyday, St. Croix was a wealthy sugar cane manufacturing island with at least 200 sugar cane plantations. Today many lay in ruins and few are still well preserved. While on an island safari, visit a sugar plantation ruin and marvel at the stone and coral structures of windmills, great houses, factory, living quarters and more. Most of this sugar cane plantation ruins now lay on private land. But some are still accessible to the public such as Estate Mount Washington in the forested west and Rust Op Twist in the north shore. Step back in time, learn St. Croix history and explore the sugar making process while at these sites. Visit St. George Botanical Gardens where nature and history blend well to create a perfect 2-3hr getaway while in St. Croix. The 16-acre botanical garden 4miles northeast of Frederiksted is a must visit. It bears history dating back to 100AD when the original inhabitants of the island first set up camp here to farm and practice horticulture. When the Danes landed in the 1700s they also favored this site and built the first sugar cane plantation on the island. Today ruins of the plantation still remain amidst a garden of beautiful flowers, trees, and numerous other vegetation. The garden is said to have over 1000 species of plants. Go walk the beautiful gardens enjoying the scent of flowers wafting in the air. You can do a self or guided tour. Both are great and you will learn plenty of information for just a $7. Step back in time and learn some history at the Estate Whim Museum and Great House. This museum features a historical great house, slaves quarter and sugar production complex. Here is where you want to go, to learn the islands past ways. This museum doesn’t only feature great artifacts and the most well-kept sugar plantation ruins but also has a living museum. A group of knowledgeable voluntary guides brings the history to life through musical stories, traditional food making technics and oral narration of the island’s history. For a mere charge of $10, this is a must visit and a great way to learn island history. You and your kids will also enjoy the candy and food offered by local women at the place. One way to enjoy the incredibly diverse landscape of St. Croix is on an ATV. There are places on the island that you wouldn’t be able to see except on an ATV. Get your dose of adrenaline on an unforgettable off-roading tour of the island. Where you will ride through the lush rainforest of the west and rocky shore of the north; learning the island’s history, exploring its flora and fauna and checking out sugar plantation ruins or climbing high areas for panoramic views of the surroundings. This is a great 2hour tour of the island that ends at Rainbow beach. Gecko’s Island Adventures is one of the most recommended tour operators that offer this excursion. This is for the adventurous at heart. Go on an enchanting tour of the island’s forest and coastline on a horse. Unlike the ATV tour of the island, this is a slow-paced adventurous exploration. Check out the flora and fauna of St. Croix. Learn a thing or two about the island’s history. And best of all get a chance to ride in the blue Caribbean waters with the horses. This is a magical experience you are not likely to forget. Some of the recommended horse ride tour operators are Equus Rides, Cruzan Cowgirls, and Paul and Jill’s Equestrian Stables. Wander around the art galleries of St. Croix. It’s an amazing experience that captures the island’s essence captured on Canvas. St. Croix has a vibrant art scene that all art lovers are bound to enjoy. From paintings to carvings, you are guaranteed a great art experience. The Artists draw their inspiration from the island’s beauty and in return create amazing unique pieces of art. Explore the art, meet the artists behind the art, watch them work or learn a thing or two in an art class and finally buy the piece that impresses you most. There are plenty of art galleries in both Christiansted and Frederiksted. Explore St. Croix off the beaten path in the scenic eastern coast. At the easternmost point of the island (Point Udall) is a scenic forest land trail comprised of scrubland and short grass that leads to the most secluded beaches in St. Croix. If you are looking to sunbathe, snorkel and enjoy a great beach day, away from the crowds then Isaac Bay is the place to go. An easy to moderate hike is required to get to the beach but it’s well worth it. The approximately 20-minute hike leads you to Jack Bay and continuing west for another 20 minutes or so brings you to Isaac bay. The reef in the area makes this beach a nice place to snorkel. Check these foot pads for spending time on the beach. Since Jack and Isaac Bay are US Virgin Island beaches there are no amenities so bring what you need for the visit. Mind the weight or portability of what you carry as you will hike up and down with it. It’s recommended to leave the windows of your car rolled down while ensuring you leave no valuable items in your car, as there has been reported car break-ins in the area. Sandy Point is one of the most stunning beaches in St. Croix and also the longest stretching 2 miles long. It features the clearest turquoise blue waters and a soft white sandy beach. It’s special in that it’s a hawksbill and green turtles nesting area. The beach bears no amenities, and you are not allowed to drive any stick into the sand to avoid destroying turtle nests. It’s very exclusive and is only open on weekends or when cruise ships are in port all throughout the year except April to August. Visit this western end beach and enjoy beach bumming and sunbathing to your heart’s content. Ensure you have company and check your swimming abilities as the waters are a bit deep further offshore. Read more about the stunning beaches of nearby St. Thomas in the US Virgin Islands. Rainbow beach is the most active beach on the island. It’s located just a mile from the Cruise Ship Terminal. It’s a lively white sandy beach with lots of activities from volleyball to jet skiing. This beach which faces the west has very calm waters perfect for swimming, snorkeling and even Stand Up Paddle Boarding. There are plenty of amenities including a beach restaurant and plenty of parking. Just carry your own umbrella for shade or rent from the restaurants at the beach. Enough of land activities. Get into the water and explore the island’s coastline from a different angle. On Rainbow Beach at West End Water Sports, you can rent floats, kayaks, stand up paddle boards and Jet Skis to enjoy a fun day on the water. You’ll need these recommend water shoes for these type excursions. St. Croix loves to celebrate and has plenty of festivals taking place all throughout the year. Some such festivals include the Agri-fare known as the mother of all festivals on the island where fresh markets are set up and islanders showcase their produce. This event comes with the famous petting zoo. Others include a fashion and art festival, Mango season festival, Mardi Gras, St. Patrick’s day and music festivals held throughout the year. But one of the most iconic is the Christmas festival that runs from Christmas to the new year, with music shows, dances, and costume parades. If you are visiting the island during the holiday season, you can experience the island’s culture by checking out this giant celebration by Crucians. St. Croix experiences typical tropical Caribbean weather where it’s sunny throughout the year. With the winter season bearing lows of the mid-70s to ’80s in December to March. A shoulder period exists between April and June. This is the period after the peak season of winter and before the rainy/hurricane season. The official hurricane season runs from July to November with peak months between August and October. The island does experience the northeast trade winds which bring a cooling effect and minimize the humidity. Expect abrupt warm showers that disappear as fast as they appeared. 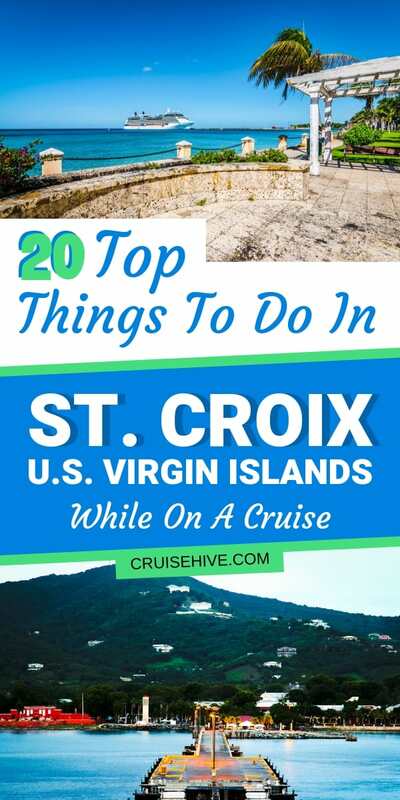 There you have it, a list of what to do in St. Croix while on a cruise vacation. But do note this is just a scratch of all the things you can do on the island. There are plenty of whimsical and quick stops you can make on the island like smiling for the island’s webcam, seeing the Moko Jumbies dance, learning to play the drums like Calypso dancers and more. Just plan your trip early and double check all the information beforehand to ensure a smooth and enjoyable day in port. That’s it from us. Remember to enjoy your vacation in St. Croix. Happy Cruising! !